It's that time of year again! With only a little over two weeks until Thanksgiving, the holiday season is upon us and I couldn't be more excited! With that being said, things can get a little crazy and somewhat overwhelming when it comes to thinking about gifts for people. We attend numerous holiday parties between November and December each year, and the topic of what to bring the host of the party is always brought up. 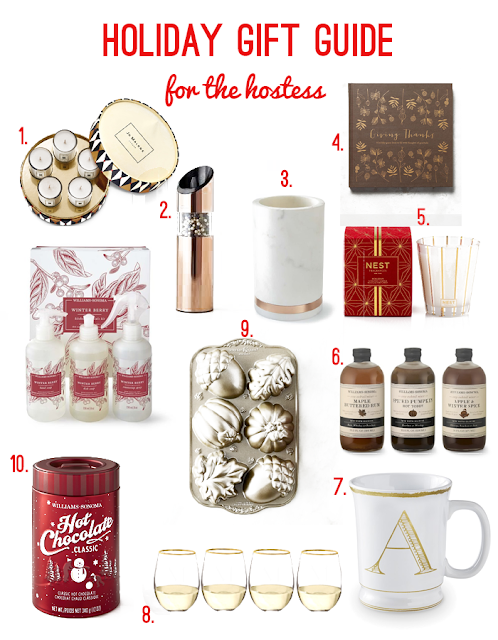 So, in the hopes of making your life a little easier, I've put together the ultimate holiday gift guide for every host or hostess on your list! 1. Jo Malone Mini Candle Collection - 5 charming miniature candles ready to bring anyones home the scent of holiday cheer! Candles are one of my favorite gift items, and with 5 scents theres sure to be one they love. 2. Copper Salt & Pepper Set (currently on sale) - Elegant battery operated mills add fresh ground salt or pepper to any meal with a flip of the wrist! If you turn these bad boys upside down above food, the blades automatically begin to whirl, how cool is that!? I have these in silver, and love them - wish I had the copper! 3. Marble Wine Chiller - Functional and beautiful to look at, this wine chiller is sure to steal the show! This would be a great gift paired with a bottle of wine. 4. Give Thanks Guest Book - It doesn't get more appropriate than this if you're headed to Friendsgiving, or the in-laws for Thanksgiving! Give the gift of sweet sentiments and memories for years to come. 5. Nest Holiday Candle - This is my favorite thing on the list! I stopped by Nordstrom and happened to pick this up and couldn't leave without one. Not only does it smell like Holiday heaven, the packaging is beautiful! I linked the single candle, but it comes in sets too! 6. Set of 3 Cozy Cocktail Mix's - Tis the season of festive handcrafted mixers! William Sonoma's mixers never disappoint. I haven't tried this particular set, but I've never picked up a mixer from them I didn't like. Add a spirit of choice, and voila! 7. Gold Monogram Mug - Add a personalized touch with this monogrammed mug for the host or hostess who loves coffee, tea, or hot chocolate! This is a perfect gift by itself, but you could also easily add a package of hot chocolate and marshmellows! 8. Set of 4 Monogram Stemless Wine Glasses - 24K gold rimmed wine glasses with a single block initial!? Need I say more? This is seriously the perfect gift for the wine lover and will be usefull for entertaining purposes as well! 9. Fall Cakelet Pan - How cute is this?! This would be the perfect gift for the host or hostess who loves to bake! Pair it with one of William Sonoma's Pumpkin Bread mix's and you're sure to be a fan favorite. 10. Hot Chocolate - This is the perfect gift idea if you're not trying to spend an arm and a leg on a holiday gift! It's thoughtful, and almost everyone loves hot chocolate during the holiday season. Plus, how cute is the packaging?! 11. Winterberry Kitchen Essentials - Lift your hosts holiday spirits with a fruit fresh blend of pomegranite, cassis, and sweet orange! I personally have this, and love the entire set. 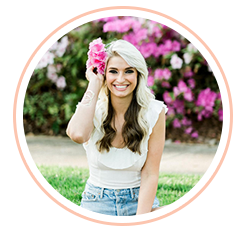 The entire set is made with natural ingredients that are also easy on your skin! So if you have someone who has everything, this is the way to go!